Quarter the pear, and remove any seeds/core. Cook four strips of bacon for a little less time than normal, and place on a paper towel-lined plate to drain briefly. 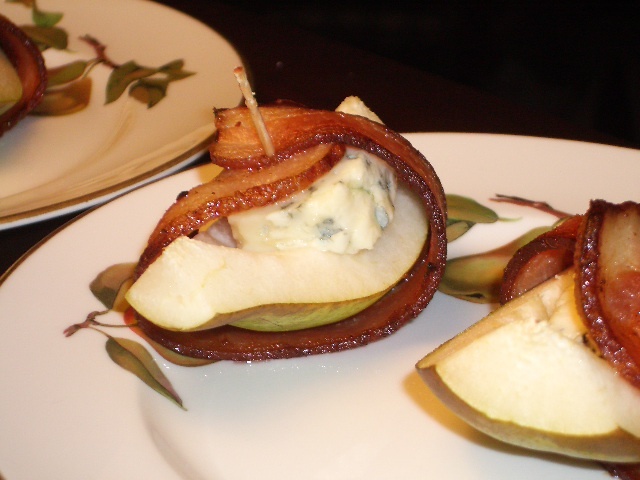 Place a little dab of blue cheese on each pear quarter, wrap with bacon and secure in place with a toothpick. I make a similar blue cheese, pear and bacon concoction. I like to put my food budget towards amazing cheese (and wine), and Jasper Hill Farm’s Constant Bliss is one of my favorites with pears. It has a creamy texture like a brie, but with very strong blue undertones. Their Bayley Hazen Blue goes better with the pear and bacon combo, as it is a much stronger blue. I encourage you to look for some at a cheese store near you. I always stock up when I’m in Greensboro, VT because it is half price there.